Common Gulls of all ages (this one, first winter) are recorded in Newfoundland each year, mostly in winter. 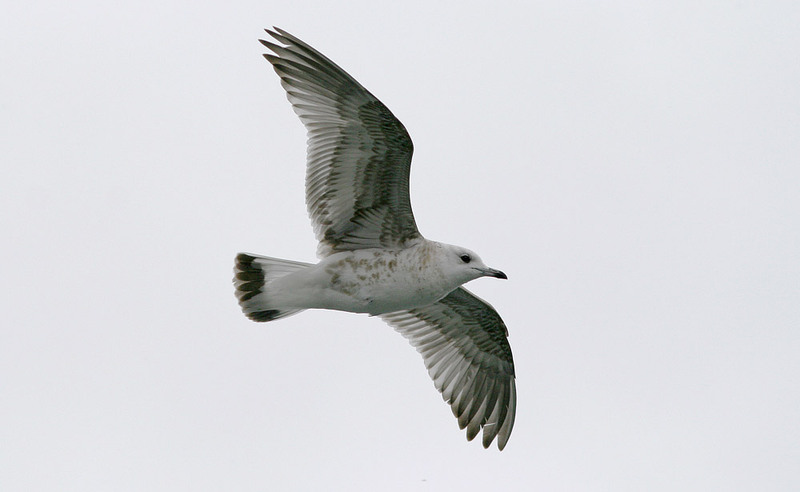 Origins: Common Gull (L.c. canus) is the European counterpart to American Mew Gull (L.c. brachrhynchus) and sometimes considered a separate species. It breeds in Iceland, northern Europe and Asia, wintering further south. American Mew Gull is not known to occur here. Details: Common Gull (aka European Mew Gull) is an annual visitor to Newfoundland – mainly on the Avalon Peninsula in winter. While most birds are thought to originate from Iceland, an individual collected from Notre Dame Bay in April 1956 had been banded in the White Sea, Russia!